Next up on my list of truly fun surprises in Nashville, breakfast at Pfunky Griddle. When I started planning my trip to Nashville, I reached out to friends who live in Nashville or who have lived in Nashville. While I do sometimes rely on a phone app dedicated to finding gluten-free restaurants or vegetarian restaurants, I don’t know who has recommended the restaurant. I have better luck with recommendations from trusted friends. 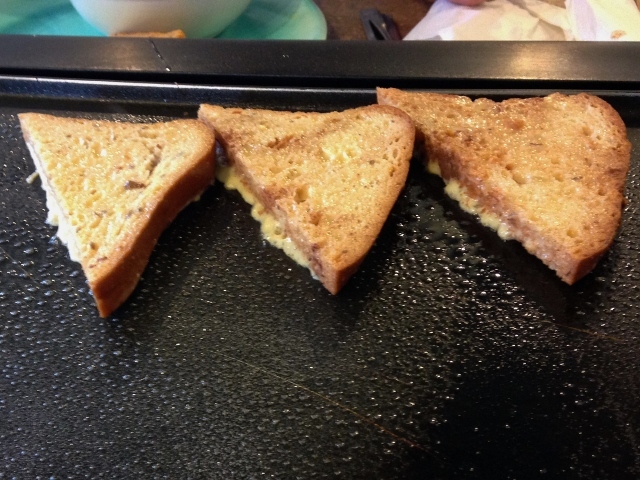 My friend Heather from Gluten-Free Cat wrote about Pfunky Griddle way back in 2011 when she lived in Nashville. 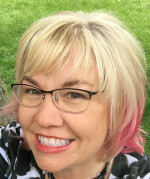 Her recommendations have always steered me right and this one is proof! 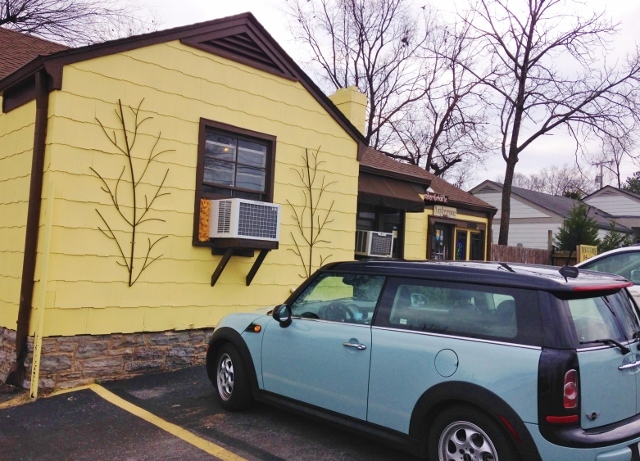 Located in the Berry Hill area of Nashville, Pfunky Griddle looks like a cute little house that has been added on to many times. Exactly the kind of place I would expect to get a comforting breakfast. There’s really not much more comforting than pancakes and French toast. 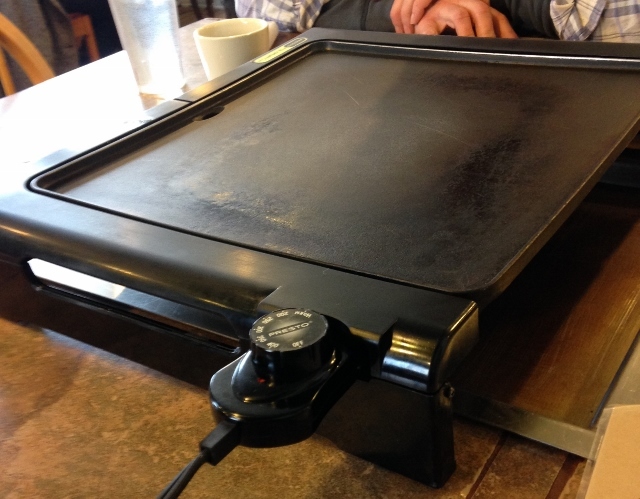 Here’s the super fun thing about Pfunky Griddle: the tables have a griddle in the middle. You cook your own pancakes, French toast, potatoes, grilled cheese… But how is that safe for someone gluten-free, you ask? 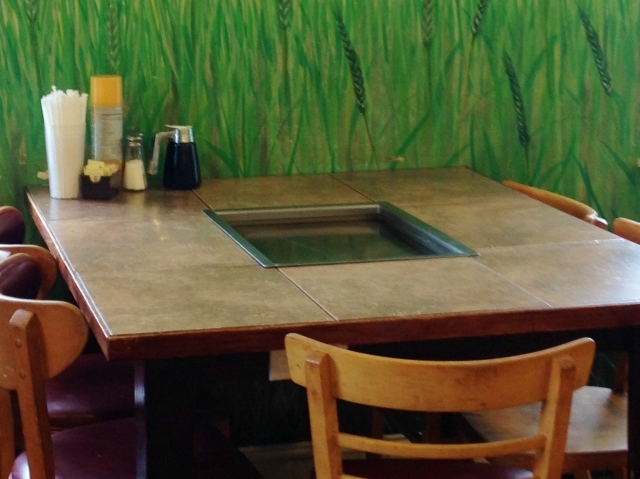 They brought out a dedicated gluten-free griddle and placed it right over the one in the table. How great is that? Cooking our own breakfast was an absolute blast! I decided to have pancakes, which are unlimited. 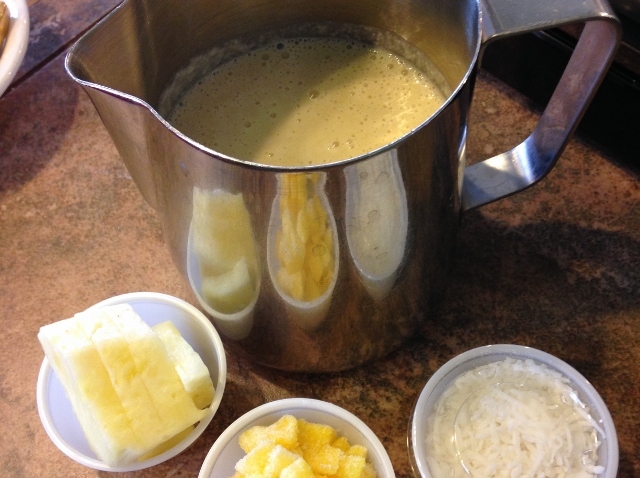 If you manage to eat all of the batter in one pitcher, they will bring you more. I have no idea how that is possible because we didn’t manage to finish one, let alone order another. 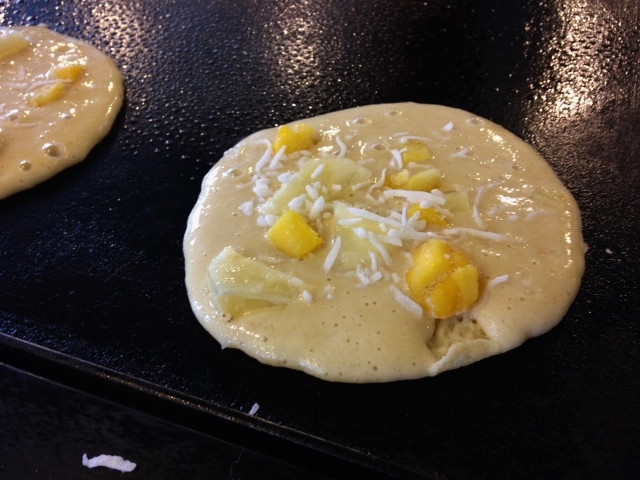 I chose coconut, mango and pineapple from the extensive list of toppings to add to my pancakes. My favorite fella ordered French toast. 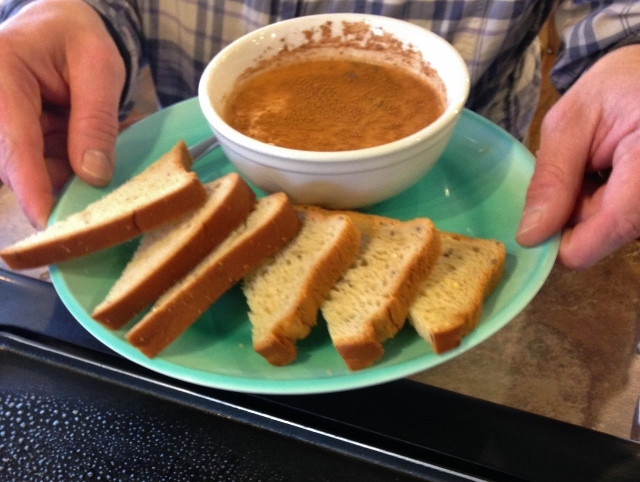 It was delivered as slices of bread and a bowl of cinnamon, milk and egg blend for dipping. I’m not going to endorse any particular bread brand, but can tell you they are using one from Colorado that does not have big holes in it. Good stuff. We also tried their potatoes, again choosing add-ins or toppings. 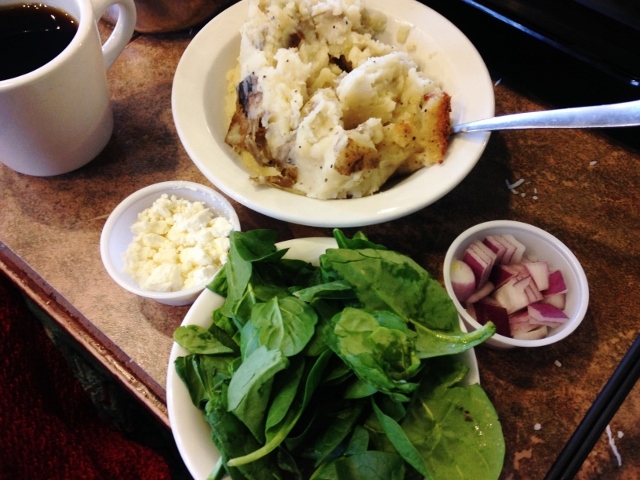 We had feta cheese, red onions and spinach. The potatoes are sort of like mashed potatoes that you cook on the griddle, making a sort of potato cake. So good! The learning curve for cooking these was a little more tricky (and cooking while sitting down at a table feels different), but our server shared some pointers and we quickly got the hang of it. 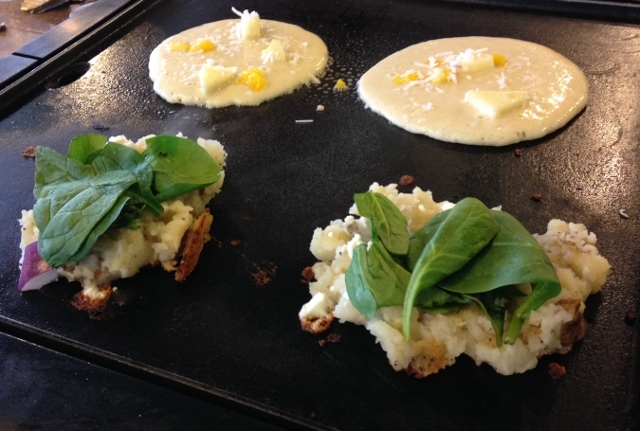 I asked lots of questions at Pfunky Griddle about dining gluten-free. Not only was our server very knowledgeable about what they do to keep gluten-free customers safe, she also wrote the nicest list of restaurant recommendations in Nashville. (Are you starting to see a pattern here? Folks in Nashville want to feed you!) On the way out, I noticed they even have their gluten-free pancake batter mix for sale. They do it right here! There are also options at Pfunky Griddle that you don’t have to cook yourself, including sandwiches, wraps, soups and salads. I hope to try a few of those on our next trip to Nashville. Beyond the food, we had a good laugh here about all of the words spelled with a “Pf.” The men’s room sign says “Pfellas.” For the remainder of our trip, my favorite fella was my Pfavorite Pfella. I’m glad he indulges my sense of humor. 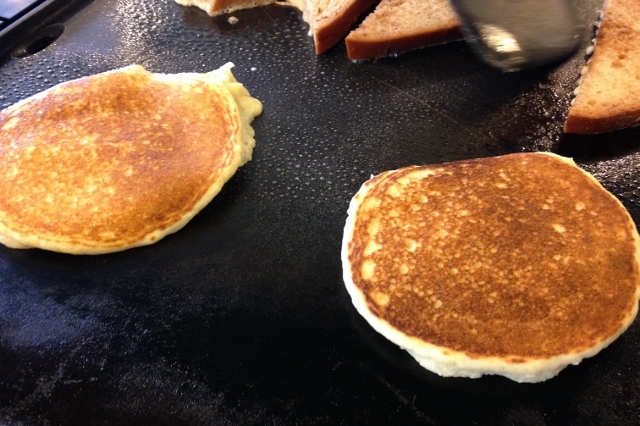 Pfunky Griddle is located at 2800 Bransford Avenue in Nashville, Tennessee. 615.298.2088. They also have a location in Murfreesboro. Visit their website for all the details and hours. We were there on a weekday and parking in their lot was plentiful. There was a sign indicating where additional parking is available on weekends. The I Ate Here series is not intended as a restaurant review, rather a summary of my experience dining out. * You may or may not have a similar experience. Menu prices, items and ingredients featured were current at the time of writing. Please read the menu carefully and ask for assistance in ordering if you have dietary restrictions. It’s a good idea to call ahead and let the restaurant know of your food needs. Personally, I don’t want to cook my food when I “Dine Out”…! What’s the point of “Dinning Out” if you have to slave over a hot griddle? Will they pay me to do this? Will I get Minimum wage? Will I have to Wash the dishes, clean the bathroom. What’s next, going to a carwash and washing your own car? Ha! We actually enjoyed cooking our own food, especially since we didn’t have to do the dishes. It was nice to have a hot pancake with no rush to eat an entire order without it getting cold. On a food intolerance note, it was also reassuring to know that I was cooking my own food with less chance of cross contamination in the kitchen. Oh my! My wife and I love this place! Nashville is such a great place to be. I agree! I’m never quite ready to leave Nashville when it’s time to head home.